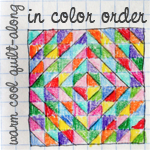 Just because I need more to blog about on occasion, I am going to bring you all on a journey through making a quilt. I'll be posting about it as I go, so it may be a bit spread out. 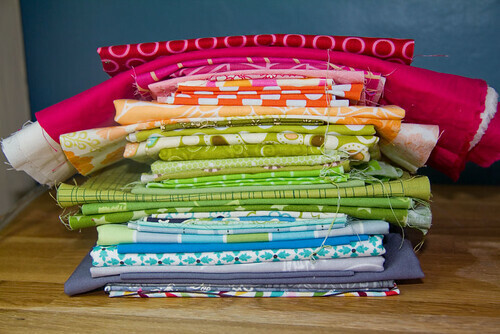 I'll start today with inspiration and preliminary fabric choices. I love the aqua/orange/grey combination of colors (I actually haven't seen the book in person yet, but on my monitors, the colors are quite muted and soft) and the wonky log cabin is right up my alley! I need a quick (hah, yeah right...)project, so the large log cabins will be perfect. 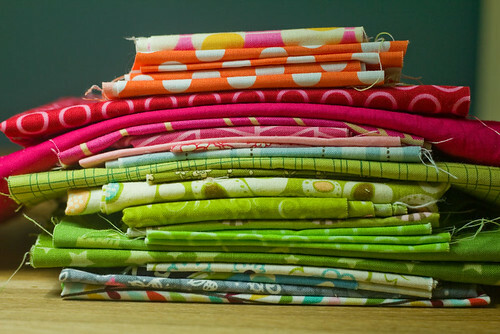 Went to the fabric store today to begin picking out a couple focus fabrics, but was unimpressed with the selection of oranges, with the majority leaning towards the tangerine/neon side. I think I'm leaning towards yellower and paler oranges to get a dusty feel. the sanctuary tiles and dandelions go so well together its unbelievable. The green I threw in just because there was a bit in the tiles, and the yellow is a nice accent, not too bright, but still very yellow. Now its time to pull from my existing stash and scrap bins! I pulled pretty much anything I thought would work in, even if it was just a teeny tiny scrap....I think I pulled way, way too much. Overall, the blues work pretty well, but most of the greens will go. 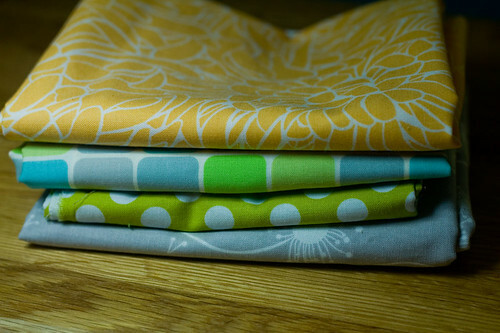 I dont want another blue/green quilt! the bright orange dot is too bright, and the pinks just plain dont go! You'll notice the pile I took out is much larger than the pile I left in. This is partly because they just didnt work, but also because I am going for a pretty edited palette. I've done more than a few scrap busters lately, and have a need to have a go at cohesiveness. I think I still might find another yellowy orange just to round it out a little, and perhaps another good aqua and grey to replace the kona solids. 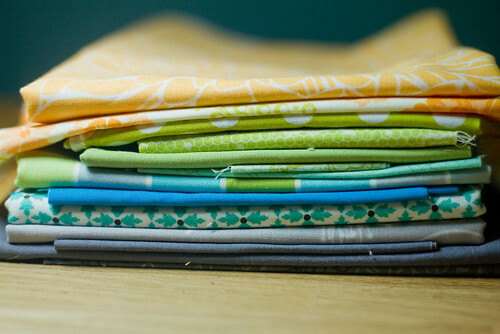 But otherwise, I think I'm pretty close to ready to cut, and its a great start for a quilt! thanks for reading, and I'll try not to take too long to post about the next step, deciding on a pattern!